The WebRTC media stack has been ported to QNX / Blackberry 10 as reported hy Hookflash in this Press Release below. This does not mean that WebRTC browsers will now begin communicating with Blackberry apps written using the Open Peer SDK, well… not today anyhow. What it does mean is Blackberry 10 developers can write apps using this new SDK to enable P2P voice, video and messaging, across Blackberry and iOS platforms using their own user identity model or mashed up with social identities. 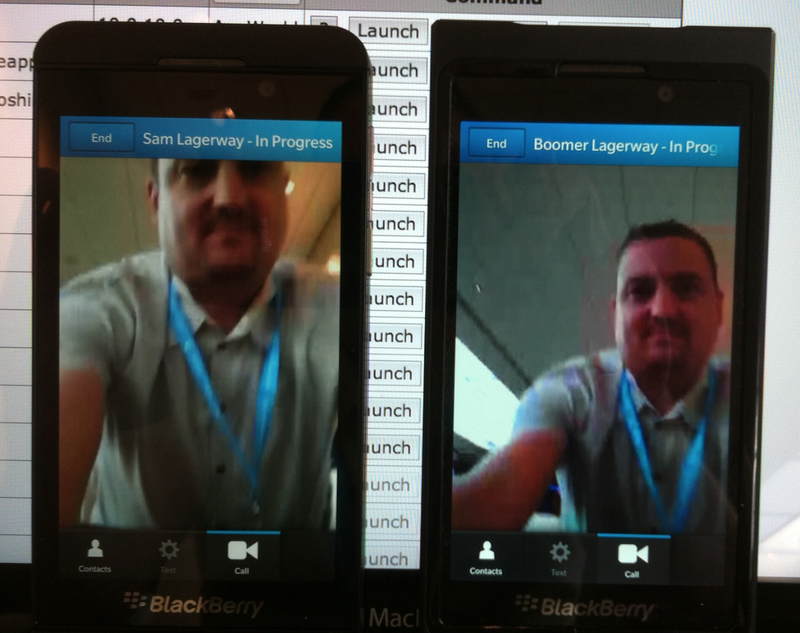 In the sample app (pictured above) running on a production Z10 and a Alpha Z10 device, Facebook was used to map IDs. BlackBerry Live 2013, Orlando Florida – May 13, 2013 – Hookflash announces beta availability of Open Peer Software Development Kit (SDK) for BlackBerry® 10, providing developers with an effective way to integrate high quality, secure, real-time, voice, video and messaging into their own BlackBerry 10 applications. The Open Peer SDK for BlackBerry 10 is the most recent addition to the Open Peer, open source family of real-time P2P communications toolkits. The BlackBerry 10 SDK joins the existing C++ and iOS SDKs already available. Mobile developers creating applications across multiple platforms can now leverage the suite of Open Peer toolkits to deliver real-time P2P communications for all of their applications. The Open Peer SDKs are available in open source and can be found on Github (http://github.com/openpeer/). Hookflash is a globally distributed software development team building “Open Peer”, new “open” video, voice and messaging specification and software for mobile platforms and web browsers. Open Peer enables important new evolution of communications; Open, for developers and customers to create with. “Over-the-top” via the Internet, where users control their economics and quality of service. “Federated Identity” so users can find and connect without limitations of service provider’s walled gardens and operating systems and “Integrated”, communications as a native function in software and applications. Hookflash founders, lead developers and Advisors previous accomplishments include; creators of the world’s most popular softphones, built audio technology acquired and used in Skype, created technology acquired and open sourced by Google to create WebRTC, and engaged inWebRTC standards development in the IETF and W3C. Developers can register at (http://hookflash.com/signup) to start using the Open Peer SDK today. Hookflash enables real-time social, mobile, and WebRTC communications with “Open Peer” for integration of voice, video, messaging and federated identity into world leading software, enterprise, applications, networks, mobile and computing devices. Hookflash and Open Peer are trademarks of Hookflash Inc. BlackBerry and related trademarks, names and logos are the property of Research In Motion Limited. BlackBerry is not responsible for any third-party products or services. Skype is a trademark of Microsoft. Google is a trademark of Google. Other company and product names may be trademarks of their respective owners. Google forks Webkit in Blink, more WebRTC fragmentation? As the go-to browser toolkit, WebKIT has been around for a long time and for the most part this open source project is owned by Apple with large contributions coming from Google ala Chrome. In reference to WebRTC, Apple is really not saying or doing much around WebRTC (at least not publicly), so it should come as no surprise that Google might feel the need to drive innovation into their new Blink project. Obviously WebRTC is not the only motivating factor here but it seems likely that it played a part. This is probably a good thing, Blink now provides an alternate solution to WebKIT and will seemingly move quicker with Google driving. It could also create fragmentation, which could (for some) be a bad thing. It also means there there is now another critical component of WebRTC under Google’s control, not saying that is bad, just sayin..
At any rate, it begs the question “Where the heck is Apple?” It would be nice to see this mobile market leader taking more of a leadership role in the development of WebRTC. They have been somewhat more vocal recently around the MTI video codec debate in the IETF but aside from that they have remained relatively silent. One thing seems certain, it will be up to Apple to maintain WebKIT now that Google is focusing on Blink. People are talking about how WebRTC could in fact create more silos in communication that it potentially tears down. The fact that this video codec debate may never be resolved is not really the biggest issue, video codecs are not that easy to come by so as developers it’s likely we will all implement the most common and accessible codecs out there, including: VP8 and H.264, that is certainly the approach we are taking @hookflash. There are plenty of answers, most of them include “http, oauth, etc”. Which in itself is great, leve the developers decide, after all it’s their app! Some more telephony-centric developers will gravitate towards a SIP or Jingle implementation. But what about those who want to federate with other P2P-centric WebRTC offers out there and still maintain some sort if interoperability? As it stands today, there is nothing that fills that gap, but that is changing quickly. “Open Peer” is being positioned as a P2P signalling protocol on the wire for WebRTC with full control over Voice, Video, Messaging and Identities: local & social. As a founder @hookflash (creators of Open Peer), I may be somewhat biased (and sometimes I have a big mouth) but if you are building for WebRTC you really do owe it to yourself to check out Open Peer: http://openpeer.org and the Open Peer SDKs on Github. Hookflash | Ottawa – looking for a few good engineers! Email join@hookflash.com with your resume. I have decided to stop posting Hookflash content here, all of my new Hookflash posts will appear over at Tumblr. Robert Scoble asked Trent Johnsen to come down to the Rackspace offices in San Francisco to talk about Hookflash. Co-founder – Erik Lagerway came in via Hookflash from North Vancouver for the meeting. The entire video is much longer 😉 We had a great time, thanks Robert!